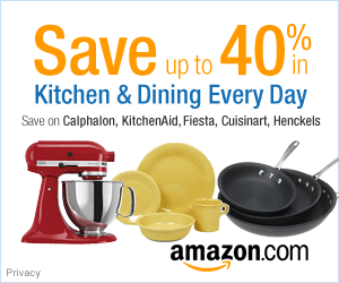 Hamilton Beach 29881/29882 Bread Machine Review - Must Read! The Hamilton Beach HomeBaker 29881 (white)/29882 (black) is actually very similar to the Sunbeam 5891. 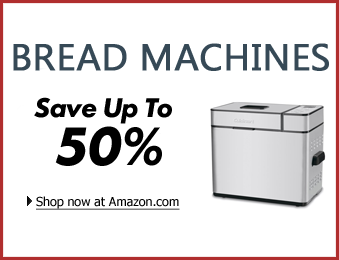 Both bread machines are advertised as making 1.5-pound and 2-pound loaves of bread. And they have 12 bread cycles each. You can set the machine at basic, French, whole grain, 1.5-pound express, 2-pound express, dough, jam, cake, etc. One really cool feature of the Hamilton Beach HomeBaker 29881/29882 is that it has a gluten-free mode. More and more people who realize they are sensitive to gluten can make gluten-free bread with this simple setting. In addition, it has light, medium, dark crusts settings, which again is the same as the Sunbeam 5891. 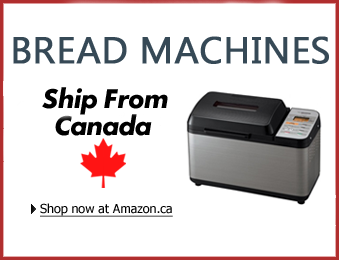 The 13-hour delay timer allows you to set the machine to bake bread at a later time. This is useful if you want to add the ingredients to the machine before going to bed to bake bread close to the morning. One neat feature of the Hamilton Beach HomeBaker 29881/29882 is that it includes an additional kneading paddle. Even though you’ll only be able to attach one onto the removable baking pan, you get an additional one in case you need to replace it. Speaking of replacing paddles, the funny thing about this machine is that when we tested it, the paddle would sometimes come loose and end up being baked right in with the bread! So we wondered if we actually lost the paddle somewhere, but it was sticking right underneath the bread. This is a small problem and you could just yank it out, but we just noticed that this might be the difference between this cheaper bread machine than the more expensive ones like Zojirushi. If this happens to you, be careful when removing it because the paddle would be very hot. As usual, we tried at least three different settings on each bread machine we test. So for this one we tried baking French bread, whole grain, and making dough. With regards to the dough, well we don’t have much to say about that than it works. The machine incorporates it well. If you regularly make pizza but not bread, we recommend this machine just for that because it’s budget-friendly. Next, for the French bread we followed instructions that came with the machine. A good idea is to follow the instructions because it might be slightly different between machines and could make all the difference. Generally speaking, you should be adding the liquids first and then the dry ingredients. The French bread was delicious! We didn’t know how well this machine would do considering it’s one of the cheaper models we bought, but we were impressed. Finally, when it came to the whole grain bread, we threw in some nuts in it. The machine automatically announced when it was time to add in the nuts, and we did so as instructed. Simple enough to make and our bread turned out great. If you are a first-time bread machine buyer or inexperienced when it comes to bread baking, the Hamilton Beach HomeBaker 29881/29882 would make a great purchase. With an extremely affordable price, this bread maker will allow you to try out baking bread with a machine and seeing whether you like it without breaking the bank or spending hundreds of dollars on a machine that you won’t end up using because you figured you’d rather go back to buying bread. Rather than baking bread by hand, which almost always is time-consuming and leads to inconsistent results, bread machines are fast and foolproof. Even if you add the wrong proportion of ingredients or leave something minimal out, the bread will almost bake nicely if not perfect with bread machines. Since the HomeBaker 29881/29882 has such an appealing price, we highly recommend it as an entry level purchase. 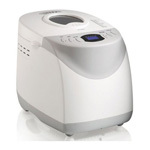 The Hamilton Beach 29881/29882 bread machine is a great budget choice. The gluten-free setting and audible reminder to add fruit and nut are handy. Highly recommended as an entry model for those entering the baking arena. We would just like to remind you that buying a bread machine will come down to individual preferences. But if you read most of Bread Machine Pros reviews, you will have already learned what to look out for. So to summarize what the Hamilton Beach HomeBaker 29881/29882 offers, it’s a bread machine on the lower end of the pricing scale, it makes a 1.5- or 2-pound loaf of bread, it 12 pre-programmed settings that include some specialty items, it has customizable crust options, it has a large viewing window at the top, and it has an audible reminder to add fruits or nuts. We imagine this machine is perfect for those looking to buy a budget model, or even something cheap to make pizza dough (without the mess!) since it would be a waste to buy an expensive bread machine just to make pizza dough if you don’t bake bread all the time. We found the Hamilton Beach HomeBaker 29881/29882 to be a solid choice for the price. I have the white Hamilton Beach bread maker and love it. It has nearly all of the same features found on expensive models. Bought mine at Walmart online for $39.97 around 18 months ago. Love using mine but the o-ring seems to eventually fall apart and make it useless unless you purchase a new pan which is almost the price of the actual machine new. I love this machine for regular bread however the cycle for gluten free seems to be incorrect. All the research that I have done shows there should not be a second rise cycle for gluten free bread. This machine has a second rise and it is even longer than for refular bread. As I have been recently disgnosed with celiac, this is quite disappointing.